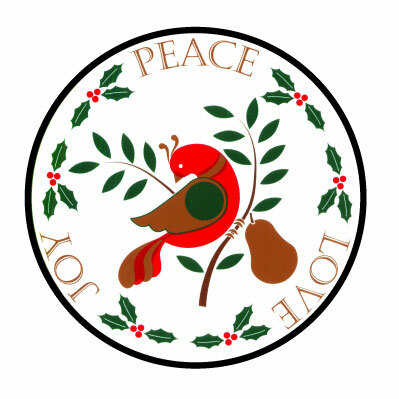 We are promised peace and hope even though the world because of greed is ruled by some technology that harms and kills so many people and even destroys the human genome itself. The first three months of the fetus is the most vulnerable to radiation exposure in the womb, females are twice as vulnerable as males. Fig.4 Assay showing effect of 2 hrs of microwave exposure (2.45GHz) at a SAR (absorption) level of 0.6 W/kg [about cell phone radiation levels] DNA strand breaks re also obvious. Section C. 1I1 - XXII - Bibliographies. Section A-I. No Safe Threshold. 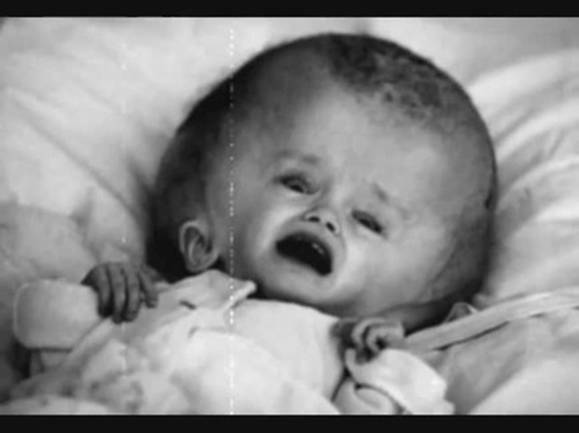 American Tragedy - Part 3 - US Kills Soldiers, Civilians and Veterans Slowly Through Depleted Uranium Contamination! Section A-I, Appendix C: Aaron Datesman, A Tiny Revolution. Section A-I, Appendix E: Professor Busby's presentation - European Committee on Radiation Risk (ECRR) Radiation Risk: the New Era Begins. 20 Years After the Chernobyl Accident: Past, Present and Future, edited by E. B. Burlakova,, p. 71. Burlakova, E. B., A. N. Goloshapov, N. V. Gorbunova, S. M. Gurevitch, G. P. Jijina, A. I. Kozatchenko, A. A. Konradov, et al. 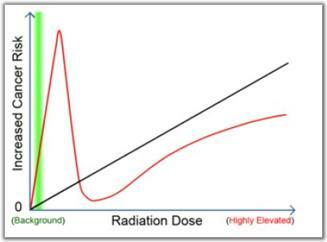 “Features of biological action of low doses irradiation.” Radiatsionnaia Biologiia, Radioekologii 36, no. 4 (1996): 610–631. Copyright ©2011, Kiyoshi IWATA & AESOP Corp., All rights reserved. @Copyright ©2011,12, Kiyoshi IWATA & AESOP Corp., All rights reserved. © 2010-2012, Kiyoshi IWATA AESOP Corp., All rights reserved. C. 1I1 - XXI - Bibliographies. This website is focused on two problems. Both have to do with the control of mosquitoes by the application of adulticides (chemicals which kill adult mosquitoes). Despite all the harmful side effects of using pesticides, and despite the fact that adulticiding accounts for only as little as between 0.0025% and 1% of those mosquito control programs which employ adulticiding [e.g., see Appendix II-W], it is still being allowed by elected and public health officials. The first section of this website deals with Naled (trade-name Dibrom) used in aerial spraying. 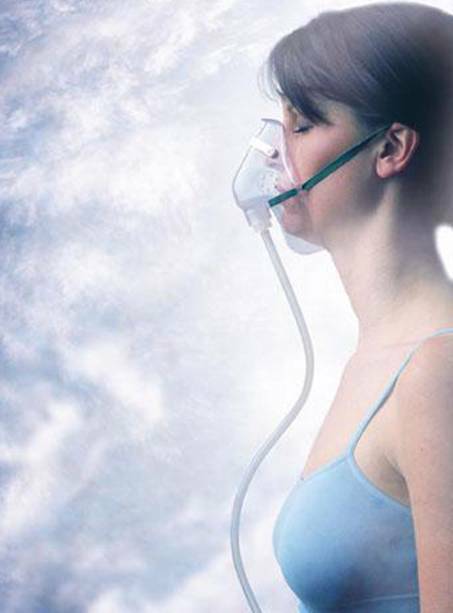 Naled is an organophosphate neurotoxin in the same family as Malathion and Sarin nerve gases. Aerial spraying is actually being planned for all of Boulder County wall-to-wall in late June or early July, 2007. The second section deals with Permethrin (a synthetic Pyrethroid neurotoxin)and Permethrin/Piperonyl Butoxide both concocted with secret so-called “inert” ingredients which in most instances are much more dangerous than the stated active ingredients. Enhanced permethrin is used with fogging trucks. Neither method is capable of evenly distributing these poisons. Both methods are applied when some wind is present so that the pesticides don’t remain in the air a long time. With both methods the pesticides drift and some households receive much higher concentrations of these pesticides than other households. Communities all over the U.S. who have banned all adulticiding have never had more cases of West Nile Virus than their neighboring communities who have opted for adulticiding. Spraying causes twice the number of neuro-invasive cases of West Nile Virus even if the actual number of mosquitoes is greater by two times in the neighboring non-spraying community [e.g., see Appendix II-R]. Besides the study published in the CDC’s journal Emerging Infectious Diseases which compares the rates of neuro-invasive WNV cases in 2003 between Loveland and Ft. Collins, Colorado, and concludes against spraying adult mosquitoes to reduce the incidence of WNV, these figures and conclusion hold true in a comparison of Boulder and Longmont in 2006. The City of Boulder had no spraying in 2006. Portions of Longmont and unincorporated Boulder County had numerous repeat sprayings. 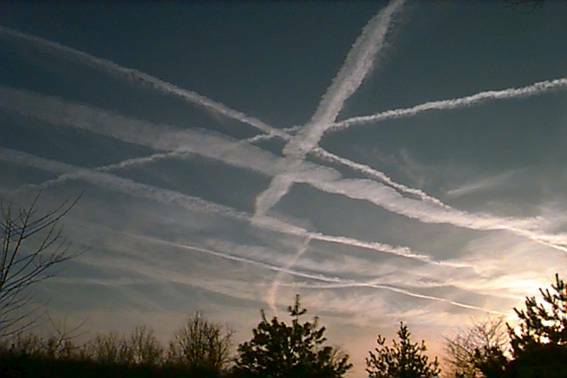 All of Longmont was sprayed on August 29, 2006. The City of Longmont had almost half of all the cases of WNV in the entire county (35 of 74) and fully one-half (4 of 8) of the total number of neuro-invasive cases of WNV in the entire county. [These figures for Boulder County 2006 are found in Appendix III-F below and for Longmont alone in 2006 on page 8 of Appendix I-Y. Click on the original URL at the beginning of the appendix to see page 8]. It is obvious that the City of Boulder’s non-spray policy is much more effective in preventing both non-neuro-invasive and neuro-invasive cases of WNV.. In looking at the statistics of the total number of cases of West Nile Virus on the CDC maps at the end of this website, it is important to look at the number of cases which are merely accompanied by fever, and those that are neuro-invasive., i.e,. encephalitis or meningitis [see Appendix III-E]. Many states report few non-neuroinvasive cases of WNV. In Colorado last year reports of cases involving only fever were more than five times the number of cases which were neuro-invasive. [280 fever only cases out of 345 cases total, or 81.2% with fever only and 18.9% neuroinvasive]. Research has shown that pesticides cause damage to the blood brain barrier and are actually a significant cause of neuro-invasive cases of WNV. Some individuals conclude that WNV cases involving fever only are equally harmful. 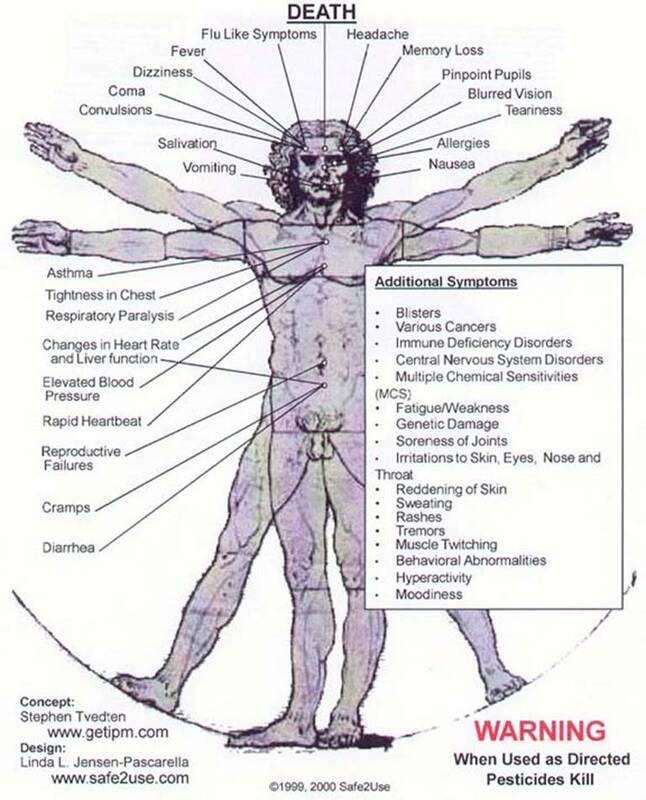 But lingering vague symptoms are similar to symptoms of pesticide poisoning. 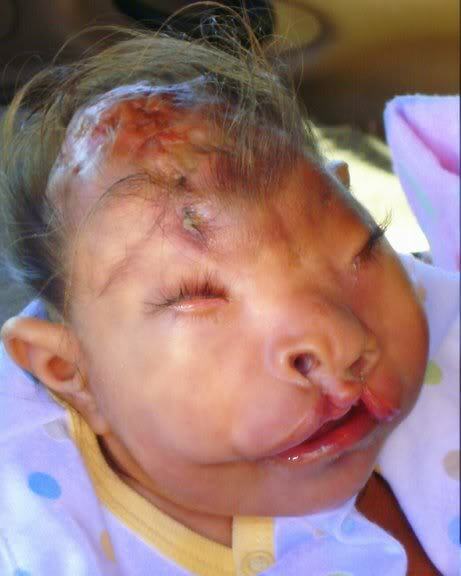 Pesticides destroy the lives of unborn and young children. They also destroy the environment and the earth for future generations, almost certainly irreversibly.. Pesticides are nerve gases, neurotoxins developed by Hitler during WW II. Simply stated, they are poisons whose purpose is to kill. Note in the yearly maps in appendix III-M of the total WNV cases in the US 1999-2006 that WNV moved from NY westward, first through the south, then westward through middle America and then westward through the north. Looking at the map of 2006 we see that many states in the east had either no cases or fewer than 10 total cases. After the initial spike in WNV cases, this spike has never repeated in any state even among those communities who have never used spraying at all. Less than 1% of those who have had WNV have any symptoms at all, though they still gain life-long immunity from contracting the non-symptomatic disease. Those who have serious symptoms include organ transplants who are receiving immune suppressing drugs so they won’t reject the transplanted organ and some others whose immune system has been compromised by exposure to pesticides. In the following appendices is a partial record of medical doctors, scientists, biologists, ecologists, environmentalists, and communities coping with WNV in the most effective and safe manner, as well as the results of bad policies. File” Appendix II-G: Permethrin and Breast Cancer: Bibliography” restored July 15, 2007]. Section D. APPENDIX I-A: Aerial Spraying Proposed – Boulder County – June, 2007. Section D. APPENDIX I-C: Pesticide Poisoning – Permethrin- What to Do?-Rapp, M.D. Section D. APPENDIX I-D: Aerial Spraying Longmont and Louisville 2003. APPENDIX I-F: Naled (Dibrom) Factsheet-J Pesticide Reform. APPENDIX I-H: Dibrom Fact Sheets. 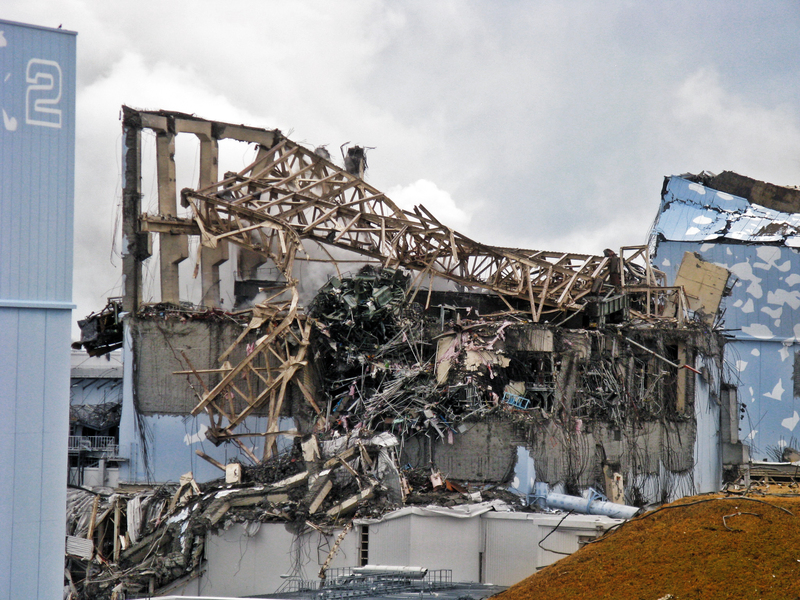 APPENDIX I-J: Dibrom: Manufacturer’s Material Safety Data Sheet. APPENDIX I-K: Dibrom – Idaho – ‘06. APPENDIX I-L: Pesticide Illness - Mesa County, CO – Aerial Spraying, 2004. APPENDIX I-M: NYC Settles Pesticide Lawsuit against Giuliani. APPENDIX I-N: Any Study of Aerial Spraying of Mesa County, CO, in 2004 Is Illegal. 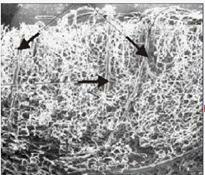 APPENDIX I-Q: Dunstan, Chemical Exposure-Blood Brain Barrier-Organophosphates. APPENDIX I-R: Geller, et al, Aging and the Environment: A Research Framework, Environ Health Perspect 2005 September, 113(9): 1257-1262 – Blood Brain Barrier – Organophosphates. APPENDIX I-Y: City of Longmont, West Nile Virus Mosquito Update, 2007. APPENDIX I-AB: E-Mail from John Pape, Epidemiologist, State of Colorado, July 5, 2007. APPENDIX II-A: Pesticide Registration: No Guarantee of Safety. APPENDIX II-B: Permethrin is Nerve Gas. APPENDIX II-C: Why Pesticide Spraying Does More Harm than Good: Overkill.. APPENDIX II-E: So-Called “Inert” Ingredients Are Not Harmless, But Toxic and Carcinogenic. Mueller-Beilschmidt, “Toxicology and Environmental Fate of Synthetic Pyrethroids,,” Journal of Pesticide Reform, v. 10, n. 3, Fall, 1990. APPENDIX II-F: Combined Exposures to Pesticides Containing Permethrin and DEET Are Not Recommended. APPENDIX II-G: Permethrin and Breast Cancer Studies: Bibliography. APPENDIX II-H: Secret Ingredients: So-Called “Inert” Ingredients are Toxic, Harmful, and Carcinogenic. APPENDIX II-I: Permethrin Kills Asthmatics. APPENDIX II-J: Illegal according to Federal Law to Say That Pesticides Are Safe. APPENDIX II-L: Non-Toxic Methods to Ward off Mosquitoes. APPENDIX II-N: “Inerts” and Piperonyl Butoxide. APPENDIX II-Q: A Tale of Two Colorado Cities: Loveland and Ft Collins. APPENDIX II-S: Communities Reject Adulticiding. APPENDIX II-T: Lessons of WNV. APPENDIX II-U: WNV Statement – Kucinich. APPENDIX II-V: Comprehensive Mosquito-Borne Disease Surveillance and Control Plan, Westchester County, NY. APPENDIX II-W: Comparing Risk of WNV. 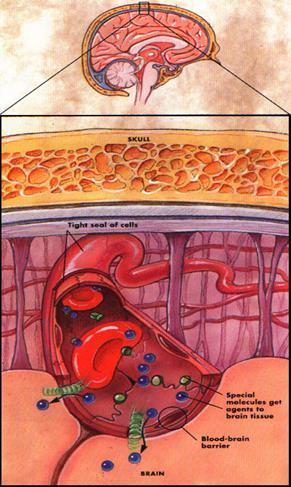 This picture illustrates the location of the blood brain barrier and the tight junction between the endothelial cells. APPENDIX II-X: Flu Vaccination Ineffective except for 1%. APPENDIX II-Z: Immune System Compromised by Pesticides-Miami: Cunningham. APPENDIX II-AA: Blood Brain Barrier – Steenis. APPENDIX II-AB: Pesticides-Dr, Ferrel, M.D. 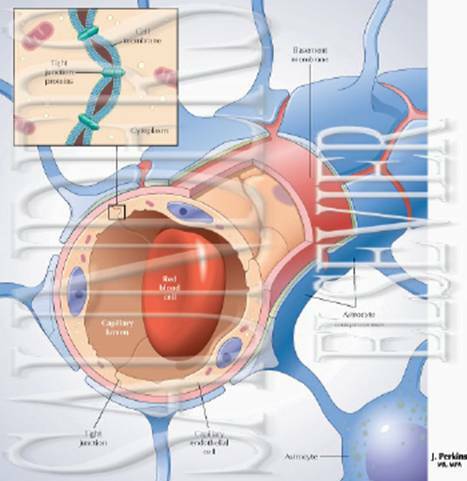 APPENDIX II-AC: Blood Brain Barrier-Goode. APPENDIX II-AF: West Nile Virus and Insecticides-Sankey. APPENDIX II-AG: Synergy-Blood Brain Barrier-Kepner. APPENDIX II-AH: WNV and Blood Brain Barrier Damage Caused by Pesticides-CCHE Research of Peer-Reviewed Articles: Ben-Nathan, et al, CNS penetration by noninvasive viruses following inhalational anesthetics., Ann N Y Acad Sci 2000;917:944-50; Ben-Nathan, et al, Cold stress-induced neuroinvasiveness of attenuated arboviruses is not solely mediated by Corticosterone, Arch Virol 1996;141(7):1221-9; 1; Kolesnichenko,et al, [Changes in the biochemical composition of the cerebrospinal fluid in acute carbophos poisoning], Zh Nevropatol Psikhiatr Im S S Korsakova 1992;92(2):95-9; Pavlovsky, et al, Pyridostigmine enhances glutamatergic transmission in hippocampal CA1 neurons, Exp Neurol 2003 Feb;179(2):181-7; Lallement , et al, Review of the value of huperzine as pretreatment of organophosphate poisoning, ; Neurotoxicology 2002 May;23(1):1-5 ; Pall, et al, Elevated nitric oxide/peroxynitrite mechanism for the common etiology of multiple chemical sensitivity,chronic fatigue syndrome, and posttraumatic stress disorder, Ann N Y Acad Sci 2001 Mar;933:323-9 ; Cowan , et al, Gene therapy to prevent organophosphate intoxication, Toxicol Appl Pharmacol 2001 May 15;173(1):1-6; Gupta, et al, Functional impairment of blood-brain barrier following pesticide exposure during early development in Rats, Hum Exp Toxicol 1999 Mar;18(3):174-9; Friedman , et al, Pyridostigmine brain penetration under stress enhances neuronal excitability and induces early immediate transcriptional response, , Nat Med 1996 Dec;2(12):1382-5 , Comment in: * Nat Med. 1996 Dec;2(12):1307-8. * Nat Med. 1997 Apr;3(4):366. * Nat Med. 1997 Mar;3(3):253; Carpentier, et al, Seizure-related opening of the blood-brain barrier induced by soman: possible correlation with the acute neuropathology observed in poisoned rats, Neurotoxicology 1990 Fall;11(3):493-508. APPENDIX II-AI: Blood Brain Barrier-CCHE. APPENDIX II-AL: Imamura, et al, Neonatal exposure of newborn mice to pyrethroid (permethrin) represses activity-dependent c-fos mRNA expression in cerebellum , Archives of Toxicology, v. 76, no. 7 (July 2002) 392-397. APPENDIX II-AM: Barlow, et al, A Fetal Risk Factor for Parkinson’s Disease, Developmental Neuroscience, v. 26, no. 1 (2003) 11-23. 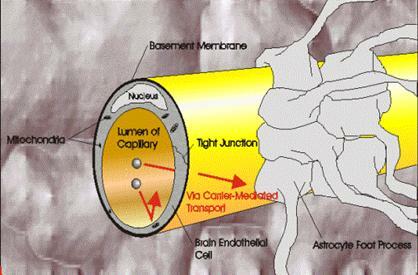 A schematic of the Blood Brain Barrier with associated astrocytes. APPENDIX II-AP: G. Wolterink, et al, Risk Assessment of Chemicals: What About the Children? APPENDIX II-AT: Truitt, The Role of Genetic and Xenobiotic Factors in the Etiology of Autism , Loyola Marymount University [Blood Brain Barrier – Autism]. APPENDIX II-AW: Sinclair, et al, Chermical Pesticides: Health Effects Research. APPENDIX II-AX: Ascherio, et al, “Pesticide Exposure and Risk of Parkinson’s Disease,” Annals Neurology, July 2006. 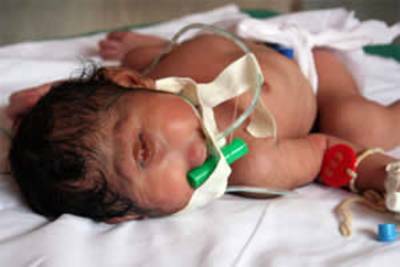 APPENDIX II-AY: Are These Symptoms of Pesticide Poisoning? APPENDIX II-BA: Letter from Malinowski, Boulder County Department of Public Health, 6-27-07. APPENDIX II-BC: Cox, “Permethrin Insecticide Fact Sheet,” Journal of Pesticide Reform v.18, n.2, Summer 98. APPENDIX II-BD: Permethrin Fact Sheet, National Pesticide Telecommunications Network. APPENDIX II-BF: Aqualuer 20 20, Manufacturer’s Material Safety Sheet. APPENDIX II-BH: Where To Buy Damselfly Larvae + Two Articles Discussing Damselflies Who Eat Mosquitoes. APPENDIX II-BI: CDC, WNV Life-Long Immunity and Testing for Immunity (IgG Antibodies). APPENDIX II-BJ: Searching for an Inexpensive Test for WNV 1: Ionescu, et al, “Amperometric Immunosensor for the Detection of Anti-West Nile Virus IgG Using a Photoactive Copolymer,” Enzyme and Macrobial Technology, volume 40, issue 3, 5 February 2007, pages 403-408. APPENDIX II-BK: Searching for An Inexpensive WNV Test 2: Wong, et al, “Diagnostic Test for West Nile Virus, U.S. Patent 200-40197769. APPENDIX II-BL: WNV Decline Due to Human Immunity-Fankhauser. APPENDIX II-BN: Campbell, et al, “Epidemic West Nile Encephalitis in Romania: Waiting for History to Repeat Itself,” Annals of the New York Academy of Sciences, 951: 94-101 (2001). APPENDIX-II-BO: Sejvar, “West Nile Virus: An Historical Overview,” The Ochsner Journal, Vol. 5, No. 3, pp. 6-10. APPENDIX II-BP: Wrubleski, “West Nile Story: One Year Later,” Conservator 25-1 2004, p. 1-35. APPENDIX II-BQ: White, et al, “West Nile Virus in Mosquitoes of Northern Ohio, 2003,” Am. J. Trop. Med. Hyg. 75(2), 2006, pp. 346-349. APPENDIX II-BR: Quarles, “Sprays for Adult Mosquitoes—A Failed Technology?,” Common Sense Pest Control Quarterly, v.17, no. 2, Spring, 2001. APPENDIX II-BS: Permethrin Persists for Years in Household Dust: Costner, et al, “Sick of Dust: Chemicals in Common Products—A Needless Health Risk in Our Homes,” Safer Products Project. APPENDIX II-BT: Emergency Spraying, Boulder, Larimer, and Weld Counties, 7-18 through 7-24-07. APPENDIX II-BV: LARVICIDING ONLY,--NO SPRAYING OF PESTICIDES--in the City of Boulder Leads to NO Mosquitoes Positive to West Nile Virus. Friday, August 10, 2007. APPENDIX II BW: Piperonyl Butoxide: Hydrolysis Half-Life 250 Days; Aerobic Soil Half-Life 79 Days; Anaerobic Soil Half-Life 927 Days. APPENDIX II-BX: Permethrin: Hydrolysis Half-Life 37.7 Days; Aerobic Soil Half-Life 25.1 Days; Anaerobic Soil Half-Life 50.0 Days. 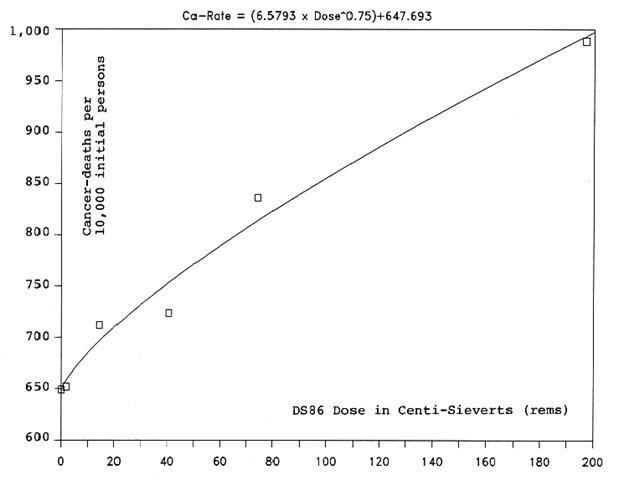 APPENDIX II-CA: Myers, et al, “Does the Dose Make the Poison?” Environmental Health News, April 30, 2007. [Permethrin is an endocrine disruptor; only one small dose can cause serious health problems]. APPENDIX II-CC: Lederman, “Is There Proof of West Nile Virus in NYC?”, August 16, 2000. APPENDIX II-CD: Doyle, “Deadly West Nile Virus For Profit – Vaccine Award Announced,” 8-3-00. APPENDIX II-CE: Great Rivers Environmental Law Center, “Position Paper: Use of Spraying to Combat West Nile Virus,” June 11, 2003. APPENDIX II-CG: Terrell, “A Pox on Government Vaccines!”, The Free Market, The Mises Institute monthly, April, 2001, volume 19, number 4. APPENDIX II-CH: Wilson, et al, “Overkill: Why Pesticide Spraying for West Nile Virus in California May Cause More Harm Than Good,” Pesticide Watch, August, 2003. 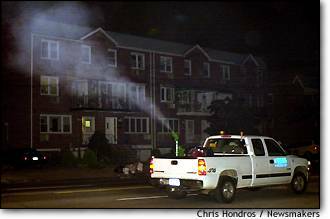 APPENDIX II-CI: Sensible, Documented Larval Program Saves the Residents of the City of Boulder from Many Cases of West Nile Virus, As Well As Saved from the Horror of Being Sprayed with Dangerous Pesticides- 8-20-07. APPENDIX II-CJ- Label of Aqualuer 20 20, NPIRS Pesticide Products Information System (PPIS) Database, Aug. 24. 2007. APPENDIX II-CK: Organic Farming-More Muddy Loach Fish Which Effectively Control Mosquitoes Which Carry Malaria and Japanese Encephalitis: Ching, “Organic Agriculture Fights Back,” Synthesis/Regeneration, 30,(Winter 2003). APPENDIX II-CN: Dangerous Inerts: Silica, Pesticide Action Network. APPENDIX II-CO: Dangerous Inerts: Trimethylbenzene Added to Piperonyl Butoxide, Cox, “Piperonyl Butoxide,” Journal of Pesticide Reform, v.22,no.2, Summer 2002. APPENDIX II-CP: Dangerous Inerts: Arsenic, Pesticide Action Network. 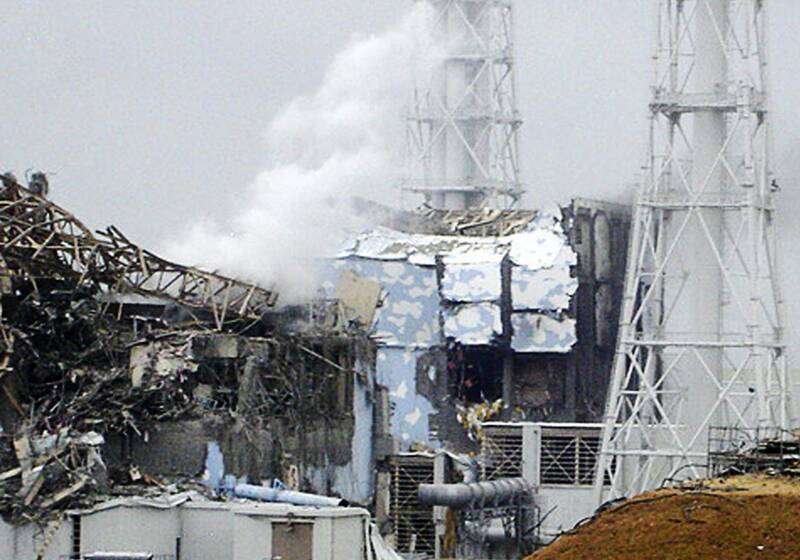 APPENDIX II-CQ: Dangerous Inerts: Ethylene Oxide, Levitt Safety. APPENDIX III-A: Flu Deaths in the U.S., 2001: 257. Pneumonia Deaths in the U.S., 2001: 61,777. Est. Cancer Deaths, U.S., 2006: 564,830. APPENDIX III-C: Cancer Deaths, U.S., 2002: 556,902. APPENDIX III-D: Diagnosed Number of Cancers, Colorado, 2002: 17,505. Deaths Due to Cancer, Colorado, 2002: 6,372. APPENDIX III-I: NIMH, Attention Deficit Hyperactivity Disorder: 2 Million Children in the U.S. APPENDIX III-J: Parkinson’s Disease – Over 1 Million in the U.S. APPENDIX III-K: Autism-1 to 1.5 Million Individuals Stricken in the U.S. APPENDIX III-L: 20 Million Americans Have Asthma. APPENDIX III-M: West Nile Virus Maps U.S. 1999-2006. APPENDIX III-N: West Nile Virus Current Maps and Charts, Colorado and U.S., 2007.